A patient presented with chronic periapical periodontitis on tooth 45. The root canal was re-treated and a wide apical perforation was closed with MTA® as an apical plug. At reevaluation six month later, the tooth presented with increased mobility, bleeding on probing and probing pocket depths of 9 mm. Despite good periapical healing radio graphically, the tooth showed signs of localized marginal bone loss that was diagnosed as being due to a cemental fracture. The tooth was splinted, a muco-periostal flap was raised and the fragment of cementum was removed. 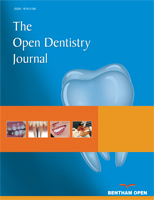 The defect was treated in a regenerative approach, using enamel matrix derivatives (EMD). Six month after therapy, the probing pocket depths decreased to values of ≤ 3 mm and a defect fill was radiographically visible. The 10-year follow up showed a stable situation. It can be concluded that the occurrence of a local delamination of the root surface may contribute to the development of plaque-induced periodontal destruction. Its removal and the regenerative conditioning of the root surface with EDTA and EMD may result in a, at least partial, resolution of the problem and regeneration of bone at the affected the site. Keywords: Case report, cemental tear, clinical, enamel matrix proteins, follow-up, guided tissue regeneration, periodontitis. © Patrick R. Schmidlin; Licensee Bentham Open.